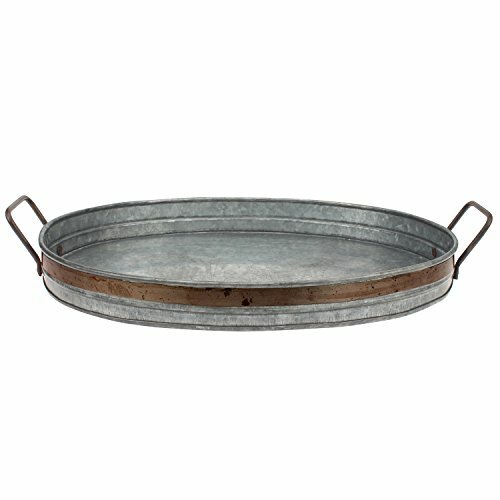 Stonebriar's rustic galvanized metal serving tray with rust trim is the perfect addition to your industrial home decor. Whether you are serving your favorite wine and hors d'oeuvres to guests at a party or bringing breakfast in bed to your loved one, Stonebriar's rustic metal tray is the perfect way to display and serve food and drink. You can also use this decorative tray as a unique centerpiece for a coffee table or dining table. Add some decorative orbs for a modern industrial centerpiece or add your favorite pillar candles and turn your tray into a decorative candle holder. This decorative metal tray features a galvanized metal base with rust color trim that has been lightly distressed giving a vintage feel and 2 sturdy metal handles for easy carry. Add a Stonebriar rustic galvanized metal tray to your home decor and instantly add interest to any room, or buy metal tray as a housewarming or birthday gift for friends and family.